Nowadays, most FingerTec customers are migrating their software from TCMSV2 to Ingress as it has more features and is more stable. However, when activating older devices using Ingress, the software will download all the past offline event that is stored in the device, which may cause unnecessary data flooding. Starting from version 3.0.2.15, three new options have been added into Ingress software to control the downloading of data. 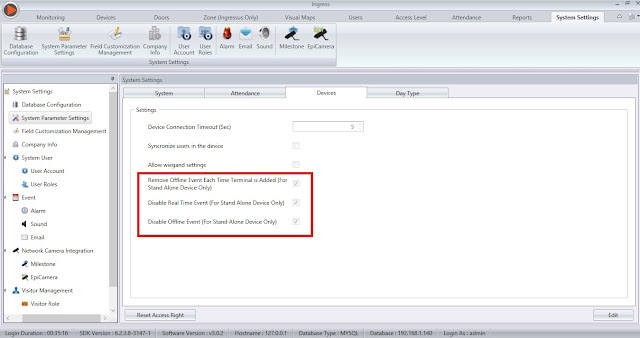 These options can be found in the Monitoring module and were created to cater for customers that are using Access Control devices as Time-Attendance-only devices. These options are being implemented in Ingress to reduce unnecessary data traffic, therefore reducing the load on the server and making data processing faster. 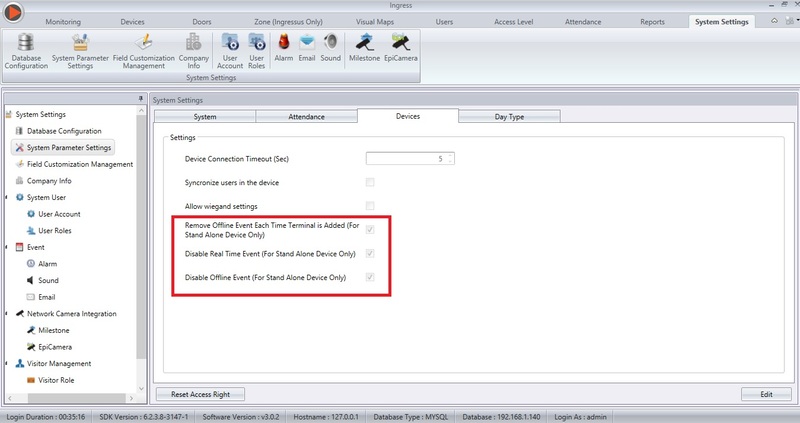 Disable Real Time Event (For Standalone Device Only) – To disable data-flow into the Monitoring module (which is mostly used for Access Control devices). Disable Offline Event (For Standalone Device Only) – To disable offline events from being downloaded into Ingress. *Offline events are the events captured and stored in the terminal when the terminal has lost connection with the software. By default, all these options are enabled, thus there will be no data available in the Monitoring module if you use any standalone devices (R2, R3, Q2i, etc.) with Ingress. To disable this feature, go to System Settings > System Parameter Settings > Devices > Un-tick the relevant check-box.